Forty-four years I've been here. That sounds simultaneously long and short--maybe because I've reached the middle of life. As a birthday present to myself, I'm taking the week to reflect on a few things I learned this last year. Last year's birthday post was a bit darker. Funny how much difference one year can make. On Monday, I wrote about my photography class and how much joy I've felt as my skills have improved. Yesterday I posted the results of a year of scripture study. In August 2008, I was training for the St. George marathon. I had run 16 miles that day, and I was feeling pretty great. Brad and I went to see Heath Ledger and Christian Bale in Batman that night, and about halfway through the movie, I excused myself to use the bathroom. After you run such a long distance, your body kind of stages a revolt--everything aches and hurts and creaks, and that is to be expected. But when I walked back to the theater, I felt something different, something very wrong. I had pain in my hips that couldn't be explained away by my training run--I had a serious injury and I knew that my marathon would have to be abandoned. I went to the doctor, but nothing really came up on an MRI. I gave up running long distances, and hoped I would heal, but a few months later, I was pregnant with Eve, so I stopped all attempts to fix my worn-out hips and focused on the new baby. Fast forward to 2012, and I had been suffering with escalating hip pain for four years. I figured eight pregnancies and two marathons had permanently damaged my hips--I couldn't walk up or down the stairs without pain shooting down my legs. I went to the doctor for more tests, but nothing new was discovered. I went to the chiropractor, and after six weeks, my hips were even worse and I could barely walk. I decided to try something completely different from running and doctors and chiropractors and suffering in silence. Last September, I began to practice yoga. 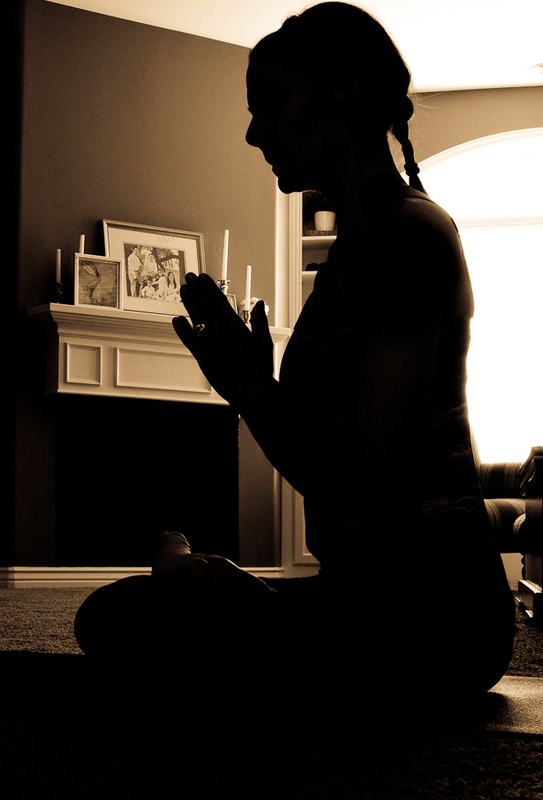 I practiced faithfully at home for six months, and then last March, I joined a yoga studio. Within a month, I noticed a marked difference in how my hips felt. By November, I was ran a 10K, and in March, I ran a half-marathon--a distance I never dreamed I would reach again. Not only has yoga enabled me to run again, it has changed my body in many other ways. When I began my practice, I couldn't touch my toes. Now, I can grasp my wrists underneath my feet and contort my body into crazy positions. I recognize the relationship between breathing and movement, and my concentration has improved. I love challenging the movements of my body, and I see minor improvements in my positions all the time. I have more muscle mass than any time in my life, and I am more aware of how I carry my body throughout the day. My posture has improved, and my stress level has dropped. I notice more creaks and aches in my body when I neglect my practice for more than a day or two, and I feel younger and better every time I leave the mat. Yoga brings focus to my exercise and forces me to look inward. To say I love yoga is incorrect. I have adopted yoga as part of my life. And what do I have planned for my big birthday day? A few errands, maybe a little shopping. Dinner with my family. And you can bet I will be at the studio on the mat today, because I can think of no better way to celebrate the beginning of 44 than with a few vinyasas and savasana. Here's to 44. May it be as amazing and life-changing as 43. Happy 44th birthday Jenny. I hope it is as fabulous for you as 43 was. As someone who is half-way into it...I can attest that it's fabulous. It is amazing to see what a difference there is between your two birthday posts, I am so excited for the changes your next year will bring! I know it is going to be an amazing year! Happy Birthday Friend! So glad that your hips are healed!! Happy birthday. You're just a spring chickie! Glad to know that yoga has helped so much. It sounds like something everyone should be doing. Hope your day is awesome and that you get spoiled rotten! What was your favorite at hone yoga routine? I'm thinking my aging joints could benefit from yoga. Happy 44th Jenny! You really had some wonderful things happen to you this year! I hope this year brings you even more good stuff! It's amazing to me that because of yoga you were able to get yourself back into running condition! Hope your day is fabulous! I've heard so many good things about yoga, and I'm glad you are experiencing so much healing from practicing it. And a very happy birthday to you, my friend. I keep trying to send this comment, but something messes up, so I hope you don't get it three times! I loved this post because I just did my very first yoga routine TODAY! I do hope I come to love it like you do, and that your birthday was fabulous! A late happy birthday to you. Yoga is the best, isn't it? It continues to help me get out of bed and move every single day. Your upcoming year should be wonderful!